My dudes, I love this skirt. I love it lots, and lots. I think it's the last of my Black Friday finds that I had left to show you all. I got it at Express for half off, and I love it so much I'm pretty much 100% sure it will be making an appearance for New Year's Eve. What's better than shiny, shiny sequins to dance all night long in and celebrate the New Year? Nothin' I tell ya. Anyway, for my first time wearing it, though, I thought I'd class it up a bit to be appropriate to go to work in. 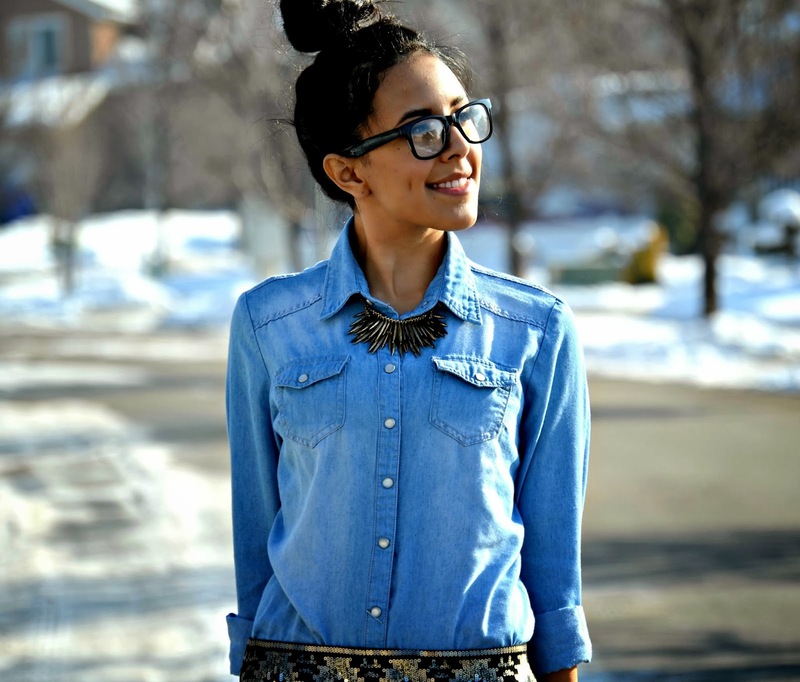 What better way to do that than to pair it with chambray, chunky jewelry, nerd glasses, and a high, high, bun? Oh, and I didn't actually get a good picture of it, but I'm also wearing a bejeweled ear cuff that my lovely older sister bought for me! Well, I'm off to jam out to my 90s/00s music playlist I just created! "This is the story of a girl! Who cried a river and drowned the whole world!!!" That is a great skirt. So pretty. I was literally listening to that song by 3 doors down haha. Also, I like brave and I didn't even know I was supposed to be ashamed by it. Mostly I just love Sara. Haha, awesome!! I'm only ashamed because I'm a snob about pop music, something about always wanting to be all alternative and "fight the man" -y. ;) Love you Lish!